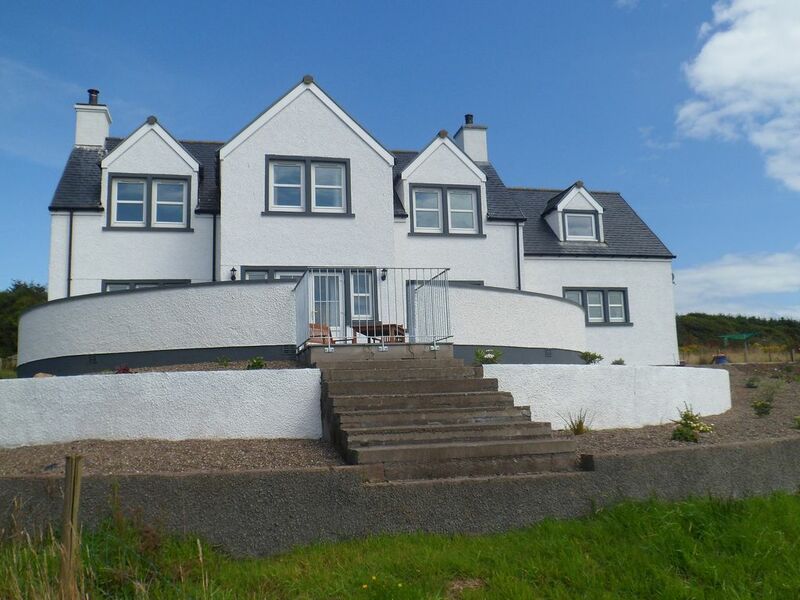 Knockinaam House provides an ideal base for a self catering holiday in the Portpatrick area. Hugh & Elspeth Little run the holiday houses along with their 2 children Tara(16) and Alec(15). We have 4 in total. Auld Schoolhouse, Beach Cottage in Sandhead, Helensdale near Drummore and Knockinaam House, near Portpatrick. Hugh is also a Farmer and Elspeth works part time in a local Bank. we have recently came back from a lovely weekend at Knockinaam House. We have visited the area for the first time and definitely not last. We were amazed by the beauty of nature and attractions. The house itself is amazing. It offers everything you need for nice and relaxing breaks as well as longer stays. Kitchen extremely well equipped. Very nice decorated bedrooms, 2 living rooms are amazing for family entertainment. The house is very clean and modern. The ambience is fantastic. All situated in extremely beautiful landscape scenery. Thank you for having us. It was fantastic. Thank you very much for taking the time to post a review on Home Away and for your kind comments. I am glad that you enjoyed your short break in our peaceful corner of Galloway and hope to see you again sometime. Wow would be a sum up to this stunning house! The house was absolutely stunning. The home made biscuits and tablet were such a lovely touch, when we first arrived the house was lovely and warm thanks to Elspeth. The kids adored the space they had in the house and so did the adults lol. The house itself is in such a lovely setting and the kids adored exploring the surrounding forest. It did have WiFi and 2 tv’s but we had such a good time just walking with the kids and having cosy chats round the log fire that we didn’t even use them. Have to say this is by far the best house we have ever had the pleasure of staying in and it certainly would be our last visit. The house is fabulous. So much space and fitted out to an amazing standard. Wildlife in abundance on the doorstep - sheep with their lambs, a very nosey pheasant, deer, hares, even a fox! The grandchildren loved it! So much that they want Gran and Papa to buy it!! Close to Portpatrick and some beautiful beaches. Lots of lovely places for coffee and cake/lunches and dinner. We walked to Knockinaam Lodge Hotel, about 30 mins, and well worth it! Beautiful old hotel and gorgeous location. We sat in the sunshine on the lawn overlooking the beach and enjoyed refreshments. Perfect! It's a beautiful part of the country. We were only there for a few nights and it was just great. Daughter and husband home for a holiday from Australia and it gave us the time and space just to catch up and relax as a family. There were 8 of us, 6 adults and 2 children and there was plenty space for all of us! Lovely homemade tablet and shortbread left for us - thank you Elspeth - was delicious! Would highly recommend! The house is big and comfortable and had everything we could possibly need during our stay. There were deer, pheasants and a hare in the garden every day. The owners were extremely welcoming and accommodating and left delicious shortbread and tablet. And on top of that the Rhins of Galloway are such a lovely place to visit - you really can't ask for much more!! Thank you very much for taking the time to post a review on Owners Direct. I am glad that you enjoyed your stay in our quiet corner of Galloway and would love to welcome you back to Knockinaam House or to any of our other properties. The house was the perfect size for our group of eight and was lovely clean and modern. The kitchen was well kitted out with everything needed to cook for eight...the slow cooker was a god send! The location was beautiful and peaceful with a lovely sunset over the sea. Portpatrick was a short drive answer worth a visit. Would definitely recommend a stay! Thank you for taking the time to post a review on Owners Direct, we really appreciate your positive feedback. We are glad that you enjoyed spending New Year with your friends @ Knockinaam House and hope to see you again sometime. Major supermarkets - Tesco, Morrisons and Lidl are located in Stranraer - 8 miles away, as are the major Scottish Banks. There is a good selection of Restaurants and pubs in Portpatrick - Campbells, Fernhill, Waterfront & Crown to name but a few. Tigh na Mara in Sandhead these are all approximately a 4 mile drive. Knockinaam Lodge Hotel - Michelin Star Restaurant, renowned for fine dining is only 1 mile away.